Walking into the Truth to Power art Installation at 990 Spring Garden Street, visitors are instantly aware this exhibition is unlike any other. Instead of Picasso and Van Gogh, they are met with breathtaking pieces of art that all speak to prominent issues, including police brutality, gun violence, and women’s rights. The installation, presented by Rock the Vote, was put together to showcase issue-based artwork from local, national and international artists. Activists and political and cultural leaders were also brought together to host panels to open dialogue about issues that affect young voters in the 2016 election. "We’re here to kick off our Truth to Power campaign which is all about speaking your truth and recognizing your power as a voter," said Luis Calderin, Vice President of Marketing and Creative for Rock the Vote. The art takes forms in all media types; Neon signs shining words like 'White Privilege,' a wooden hand-crank machine that spits out a penny every three seconds representing the work behind minimum wage, and even a hanging mural of toe-tags with the names of people killed by police. 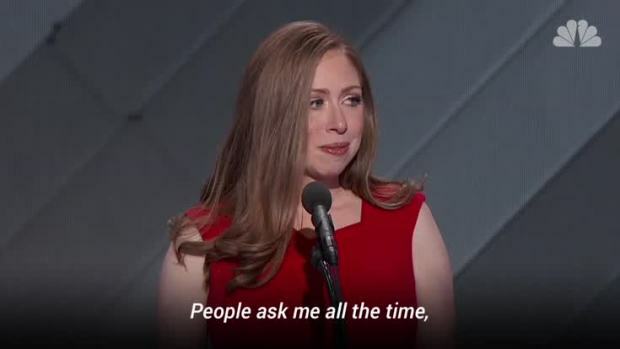 Chelsea Clinton Speaks at the Democratic National Convention on Thursday night. The installation hits home for artist Russell Craig, whose piece 'Self Portrait' sits right next to famous street artist Banksy’s piece for the collection. Craig’s art shows his image sitting atop his sentencing papers, as well as his halfway house papers and parole papers. It stretches across 4 separate canvasses, which represents the crosshairs of being targeted. "I put my face on the piece with pastel, symbolizing the stuff that I went through and it's supposed to be behind me, but in reality the stigma of being an inmate or an ex-con is a hinder to getting jobs," explains Craig, who said he taught himself how to read and write while in prison so he could read books on how to become an artist. The issues don’t just hit home for artists --Visitors admit the artwork is eye opening and makes them think deeper about the issues surrounding the election. Largest DNC Addiction Caucus Ever Draws Hundreds in Phila. "It’s a very impressive collection of a lot of very different media from what you would normally see," said Juliana Rockefeller, glancing back at the police brutality piece beside her. "I think what I’m taking away from it more is that there’s a lot of hope in this younger generation, that there’s something more we can do about these things if we just increase the awareness." Alexis Wilson, still buzzing with excitement after meeting political activist Angela Yvonne Davis, says she is thrilled to see artwork that speaks to important issues. "I love art in general but especially pieces that communicate this type of power," explains Wilson. "Immediately you come in and it’s talking about mass incarceration, really illustrating that theme of speaking truth to power… already, I’m riveted." 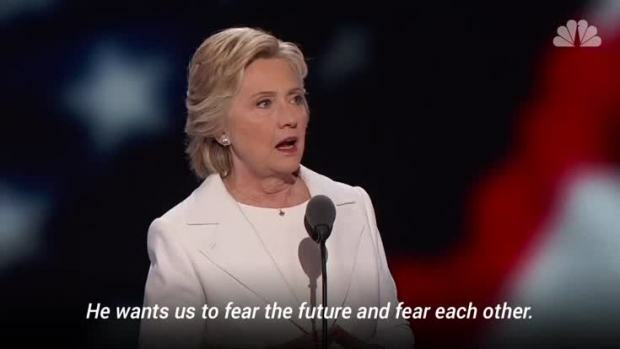 Remarking on Donald Trump's reliance on fear, Hillary Clinton quoted President Franklin Delano Roosevelt's famous fear quote that he gave during the throes of the Great Depression. Abdul Hamid agreed with other visitors that one piece in particular stands out in the room, as the installation takes up an entire corner of the space. The installation is a large sculpture showing guns, hanging by threads in the shape of America as you face it head on. However, as you make the right around the piece, it transforms into the shape of a gun. "This piece is really speaking volumes right now," said Abdul Hamid, who says his friends recommended he check out the gallery and he is definitely happy he did. The gallery's success and the outpouring of positive response opens up an opportunity for new conversation about important issues facing young voters. "At a subconscious level, strong, powerful, issues-based art speaks to your heart… It will grab you and tug at your heart," said Calderin. "This particular type of art allows viewers to really think about these issues, as opposed to the dialogue, the banter, that goes on about the issues. We want people to actually feel it and interact and have an emotional reaction to it." Folks in Philadelphia can celebrate the close of the show and 25th anniversary with a concert by the Black Eyed Peas tomorrow night at the Fillmore Wednesday night. For tickets and more information on Rock the Vote, visit their website.